During the nineteenth century there was little agreement among doctors on the definition or causes of insanity. Some behaviors were frequently ascribed to the mentally ill, nonetheless, the extent to which they derived from the social milieu or medical understanding was blurry. Whether its cause was thought to be moral, hereditary, environmental, or a physical disorder (of the brain), insanity found different levels of acceptance among doctors. However, an imprecise consensus located the cause of insanity as an interaction of biological and environmental factors throughout the nineteenth century. Although the definition of insanity remained vague, doctors largely agreed that their treatment had improved radically upon the past. The first part of the nineteenth century was characterized with a "faith" in moral treatment, which was believed to reverse the individual misbehavior or environmental factors of disease. Initiated by Philippe Pinel of France and William Tuke of England, moral treatment became the dominant tendency in Western Europe and the United States. The fame and promises of the moral treatment travelled to the Ottoman Empire, and particularly Pinel came to symbolize the contemporary approach to mental illness. Briefly, the medical practice of the first half of the nineteenth century was fluctuating between science and religion. The second half, on the other hand, was characterized by medicine locating its roots in a biological-oriented science aided by a new kind of technology. This tendency toward an organic understanding of madness was also the case in the Ottoman Empire. An important date in the history of modern Turkish medicine is considered the establishment of the first medical university by Mahmud II on 14 March 1826, supported by many scientists coming from Europe. The study and practice of modern psychiatry in the Empire started with Dr. Rasit Tahsin at the end of nineteenth century. Tahsin began to offer psychiatry education by establishing the Neurology and Psychiatry Service (Asabiye ve Akliye Servisi) in the military medical school (Askeri Tıbbiye) in Gulhane, Istanbul in 1896. However, the "treatment" of the mentally ill dated back to centuries ago, all the way back to the Seljuk Period. The literature as well as the popular history attributes a rather humane attitude towards semi-holy "madman" (mecnun) in the Seljuk and earlier Ottoman periods. Traditionally, during the Ottoman era the mentally ill were kept in small asylums (bimarhane), which were incorporated in religious complexes (külliye). These complexes consisted of facilities such as mosque, public kitchen, medreses, caravansary, mausoleums, and were funded by foundations (vakıf). Some also had a hospital or asylum. In Istanbul, Fatih, Haseki Sultan, Sultanahmed and Suleymaniye Darussifas housed the insane starting from the fifteenth century. Toptasi Asylum became the major public in the Ottoman capital after 1873 with the transfer of mental patients from Suleymaniye Asylum on November the 8th, 1873 (27 Tesrinievvel 1279) because of an epidemic similar to cholera. At the time Dr. Louis Mongeri was in charge of the asylum. Dr. Mongeri was responsible of improving the conditions in the asylums and starting to establish the practice of modern psychiatry in the Empire. He was also the name behind the first official regulations regarding asylums that was published in 1876. Toptasi Asylum in Üsküdar, also known as Valide-i Atik Bimarhanesi or Toptaşı Nurbanu Valide Sultan Darüşşifası was part of the Nurbanu Valide Sultan Külliyesi, later called Atik Valide Külliyesi, which is erected by the mother of Murad III, Nurbanu Valide Sultan between 1570 and 1579. 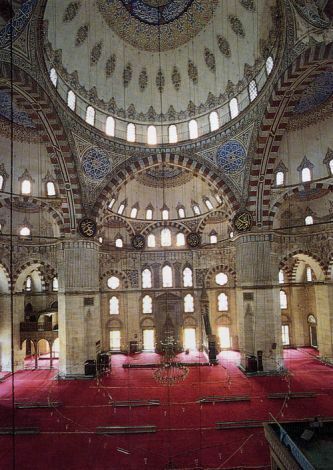 Similar to Külliye of Süleyman I, this religious complex is composed of buildings such as mosque, medrese, tekke, sıbyan mektebi (primary school), darülhadis, darülkurra, imaret (public kitchen and caravansary), hospital and a public bath (hamam). Of these facilities, darülhadis, darülkurra, imaret, and hospital were located on the same lot forming a uniform building. This part of the complex gained new functions by the end of the eighteenth century. Imaret and hospital were used as military barracks (c. 1800-1865) before they started to function as an asylum between 1873 and 1927. Toptasi Asylum was administered by Dr. Mongeri (1873-1882, until his death), Kastro (1882-1909), Dr. Avni Bey, and Mazhar Osman. Toptasi was not the only asylum that existed in 1870. Other asylums, such as the Haseki Sultan and Sultanahmed also housed the insane, and some general hospitals like Zeynep Kamil and French La Paix Hospital. The French La Paix Hospital became an actor in this story. Originally established in the form of tents by French nuns invited to the Empire during the Crimean War (1853-56) for the treatment of French and Ottoman soldiers, this institution became a hospital with donation and gifts, on a lot in Şişli allotted by Sultan Abdülmecid I. In time, the hospital started to accept mentally ill patients. Non-Muslim minorities, including the mentally ill, were hospitalized in minority hospitals many of which were established in the 1830s: Armenians in Surp Pırgiç Armenian Hospital, Greeks in Balıklı Greek Hospital, Catholic Armenians in Surp Agop Hospital, and Jews in Or-Ahayim Jewish Hospital. During the truce period (1918-22), with the initiation of Mazhar Osman, the physicians asked the new government to use the abandoned Reşadiye Barracks in Bakırköy as the new, "modern" mental hospital. After the establishment of the Republic of Turkey, the barracks as well as the land they were located in were assigned to the institution in 1924. The hospital was opened in 1927 with the name Emraz-ı Akliye ve Asabiye Hastanesi (Mental and Neurological Illness Hospital) and Mazhar Osman was appointed as the head doctor. The hospital was a twenty-minute walk distance from the train station and there was no other public transportation. The buildings were abandoned and dilapidated after the French soldiers occupied them for some time during the truce period. In 1934 the new, twenty-first pavilion, and in 1935 the polyclinic was built. Another new pavilion, the central building and dining hall were opened in 1938. Following the university reform in 1933, psychiatry and neurology clinics of the Istanbul University were located in Bakırköy Mental Hospital. Unlike Toptaşı Asylum, which ceased to function as a medical facility after 1927, Bakirkoy Mental Hospital has continually transformed in parallel to changing medical standards and is still a major education and research hospital dedicated to psychiatry and neurology. It is now called Bakırköy Ord. Prof. Dr. Mazhar Osman Ruh Sağlığı ve Sinir Hastalıkları Eğitim ve Araştırma Hastanesi after Mazhar Osman. Ayten Altıntaş, "Üsküdar'da Bir Akıl Hastanesi," Üsküdar Sempozyumu IV Bildiriler, 2006, 391-412. Sahap Erkoç, "Osmanlı'dan Günümüze İstanbul'da Psikiyatri Kurumları", İstanbul48, Tarih Vakfı, 2004. Fahrettin Kerim Gökay, "Bakırköy'de On Yıl" in Resadiye Kıslasından Hastaneye 80 Yıl Anıları 1927-2007, Actavis, İstanbul, 2007 . Mazhar Osman, Tababeti Ruhiye, İstanbul: Kader Matbaası, 1941 (third edition).